Okay, this gets complicated, so follow along: Shiprock & Achordog is the name of an acoustic band that specializes in using music and lyrics (even rap!) to educated children about animals. It’s also the name of a comic book series they have created following the adventures of two dogs with that same name, Shiprock & Anchordog. 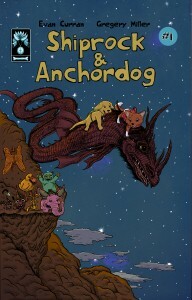 In their first adventure, the canine companions travel back in time and befriend a family of dinosaurs. The band’s official web site explains it all more fully, as well as other educational programs they’re involved in. The comic was written by Evan Curran and illustrated by Gregery Miller, who also has his own web site devoted to this and other illustration projects (which he seems to have a lot of! ).